The Bio Bidet BB-250 doesn’t require any electricity or a battery, making it a very eco-friendly toilet seat bidet. It has user-controls for temperature as well as water pressure. Dual nozzles give you the hygienic qualities that you need with a separate nozzle for feminine cleansing. Those looking to reduce their impact on the environment will appreciate this easy-to-install toilet seat bidet. It fits over almost all 2-piece toilets and most 1-piece toilets as well. This bidet comes in round or elongated to fit your needs. 3 Comments on "Bio Bidet BB-250"
This bidet seems a little flimsy, but I guess that is an all right trade-off for portability. And the fact that it doesn’t need electricity is nice as well, and you can get warm water by just hooking it up to your sink. Make sure you look at the illustration, it doesn’t fit a lot of bigger, rounder types of toilets. Once installed it works just fine, good pressure and easy-to-use controls. I don’t know if I would buy another if it broke, I might invest in something a little nicer. 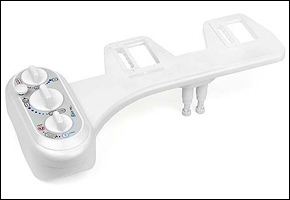 But for a bidet without a seat I would say I’m pretty satisfied with the 250.
i have the three control modle # 250. what is the first control nob for. i had assumed the hot water feature didn’t work until i ran the water first until it got hot. i thought the hot water would be there at all times. would i have to tap into the hot water tank instead of the sink? The first control nob is for switching between male/female nozzle or you can use both in same time. Regarding the hot water you are right, it depends if you have a water circulation system at your house or not, just like a regular use of sink tap, so i advice to push the self clean button to let the hot water circulate into the pipelines, then start to use the nozzles, it will not take more than 20 sec.